Programs based on this commonly used equation for inductance are not correct for the small inductors needed for use in microwave L-C filters. The equation usually yields coils that are about 1 turn short out of 5! Accurate design of small single layer air-wound inductors for microwave filters can be done using this free software. The program is based on work done by Fredrick W. Grover. 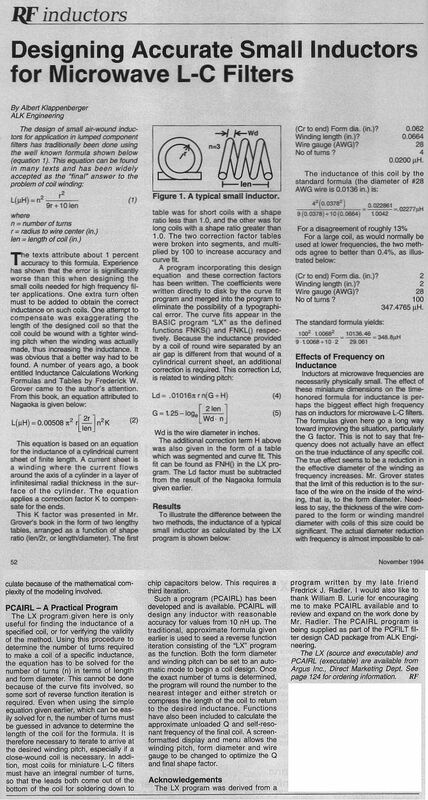 This is the latest version of the PCAIRL program described in RF design magazine, November 1994, page 52. New version 4.0 for Windows with mouse control and integrated optional standard drill bit size winding diameters.